Qigong: Qi (pronounced chee) means energy or life force. Gong means work or exercise. Combined, qigong means energy work or exercise. Qigong is an ancient Chinese system of self cultivation, developed specifically as a means for an individual to take full responsibility for promoting one’s health, promoting vitality and prolonging life – a personal health care system. Qigong is a gentle physical activity for promoting health and as a moving meditation for stress management. 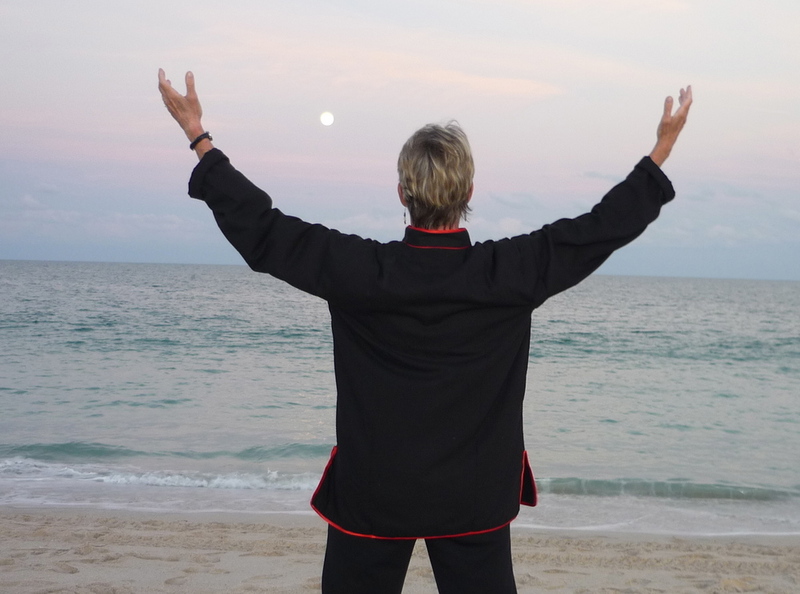 Even though there are many forms and styles of qigong, they all share four basic components: 1) body posture, adjustment/alignment and gentle movement; 2) meditation, awareness and purposeful relaxation, 3) breath regulating practice, and 4) self-administered massage/shaking or tapping. Qigong is often called acupuncture without needles. According to Daoist, Buddhist, and Confucian philosophy, respectively, qigong allows access to higher realms of awareness, awakens one's "true nature", and helps develop human potential. “As the chi flows” is a phrase I use to describe my everyday life. Chi (Qi, prana, ki) means energy. We are all energy beings surrounded by energy, connected to all energy. Energy flows just as water in a river flows. Sometimes the current can be gentle and sometimes very turbulent. Water that comes up against an obstacle can become stuck or stagnant. When the blockage is removed, the river moves freely once again. Tuning in to the rhythms of life around us, we are more easily able to flow ourselves. Breath, movement, intention, mindfulness play a key part in finding this flow. The phrase “as the chi flows” reminds me to connect and remain aware of my connection to everything around me. The energy of the sun, the moon, the stars, the ocean, the trees, all of nature, the patterns of the day, the seasons of the year all play a part in this rhythm of life that we are all connected to. The moving meditations of qigong keep us connected and flowing with the wonderful rhythms of energy in our own bodies and with the flow of energy in the entire universe. -"Janet Zabrosky"
Ready to take the next step? Join Janet and and awaken your true nature. (C) 2018 AsTheChiFlows.com - Workshoppe Productions - All rights reserved.